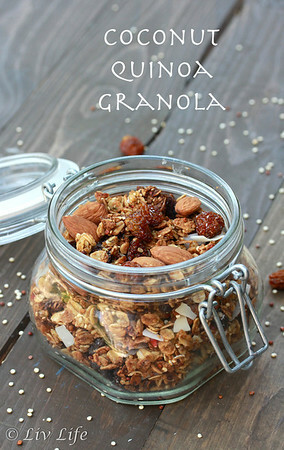 Filled with superfoods (quinoa, flax, hemp and goldenberries) in addition to heart healthy oatmeal and walnuts, this granola makes an ideal snack whether it's eaten out of hand or as a topping to your favorite yogurt parfait. Measure the oatmeal, quinoa, flax meal, hemp and cinnamon into a large bowl. Set aside. Melt the coconut oil if it is solid (a few seconds in the micro should do the trick!). Set aside. In a medium bowl add the egg white, salt, vanilla, maple syrup and brown sugar, whisk until well combined. Add the egg white/sugar mixture to the oatmeal mixture and stir a time or two, then add the melted coconut oil (I found if I added the warm coconut oil to the cold egg it hardened, hence we made two steps out of it). Stir all the ingredients together to evenly combine. Pour the oat mixture onto an oiled jelly roll pan, spreading evenly with a spatula. Place in the pre-heated oven. Stir after 15 minutes, making sure to incorporate the edges into the center (the edges will brown faster) of the mixture. Check and stir again after another 7 minutes or so. At this point our granola needed another 4 minutes to become perfectly browned. Keep an eye on yours as it can go from nicely browned to perfectly burnt in a flash! 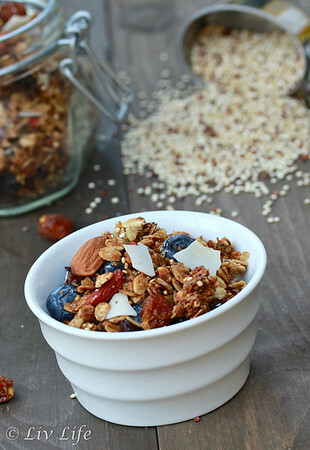 Remove granola from oven when nicely browned and immediately add the dried fruits, coconut and walnuts. Give a little stir and allow to cool. I've read that homemade granola will last up to 2 weeks, but ours never stays around that long. Enjoy! Liv Life Note: Last time we made this granola we ran out of eggs... using 3-4 Tbs of coconut oil and skipping the egg white made the granola even crunchier! Kim, this granola sounds amazing, I love all your ingredients. I have tried hemp or golden berries. Thanks for the tips! I'm loving the Goldenberries, Chris! 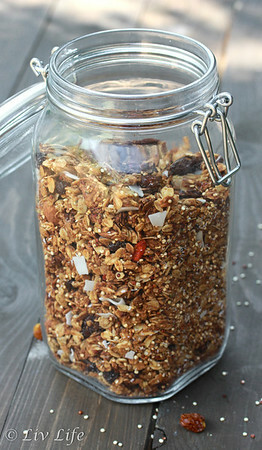 Love home made granola, the addition of coconut oil and coconut flakes is great. Thank you Asha... the coconut is a favorite of mine as well! sounds great except that quinoa can not be digested raw. It has to be cooked or sprouted before our bodies can benefit from any of its nutrients. Marika... thank you! I did a bit of research after your post, and you are correct. Unfortunate! I adore the crispness of the quinoa. Will have to see what I can incorporate with cooked quinoa. Thank you! 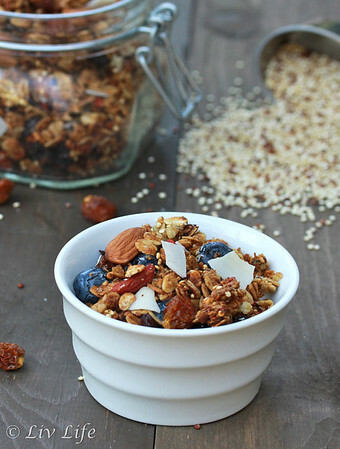 I've always wondered about using quinoa in a granola! Will have to try this out.